School shootings in Florida and Texas spur investment in entryways and surveillance cameras, stronger partnerships with police, and active-shooter training for teachers and staff. This is the summer of stepping up school security. Syosset school officials are heightening protection by upgrading entryways in the system's 10 buildings. Massapequa’s school board approved the hiring of armed guards in the district. Montauk schools are installing more internal cameras. 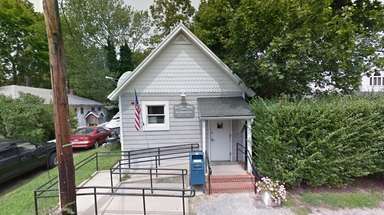 Sayville improved external cameras and increased security staff hours. And when the 2018-19 year begins in the Harborfields district in Greenlawn, visitors will be required to wear identification badges that include their photo. With safety concerns reinforced by mass shootings at Marjory Stoneman Douglas High School in Parkland, Florida, and Santa Fe High School in Santa Fe, Texas, these are but a few examples of the flurry of changes to facilities and policies taking place in public school districts across Long Island. Suffolk County Sheriff Errol D. Toulon Jr., speaks during an active shooter presentation to teachers and staff at Riverhead High School on Monday, June. 4, 2018. This is one of several sessions the Sheriff's Office has conducted since the Parkland shooting. It focuses on training teachers and staff should there be an active shooter event. This goes along with vulnerability studies the office has been conducting for school districts. The coming school year holds the possibility that the state may add "active shooter" training in schools to long-required lockdowns and fire drills. Already, officials in districts Islandwide say they have strengthened relationships with law enforcement, and those agencies are conducting training sessions for faculty and staff members on response to active shooter situations. Seventeen people were killed and 17 others injured in the Feb. 14 shooting at the Florida high school, sparking outcry and demonstrations nationwide, with thousands of students participating in planned walkouts and marching for increased gun control. That fervor continued after the May 18 shooting at Santa Fe High School in Texas that left 10 people dead and injured 13. In each case, the suspected shooter was a teenager who had entered a building he knew well. Nikolas Cruz, 19, a former student at the Florida school, is charged with multiple counts of premeditated murder and attempted murder. Texas student Dimitrios Pagourtzis, 17, faces capital murder and other charges. 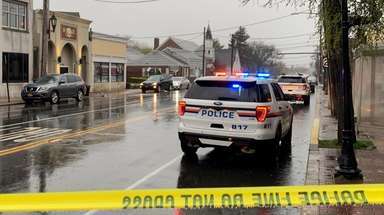 Locally, following the December 2012 killings of children and staff at Sandy Hook Elementary School in Connecticut, many districts ramped up security and were continuing to plan or make upgrades. After Parkland came fresh urgency. In the spring, more than 40 percent of candidates in contested races for school boards on the Island cited security as their top concern, according to information they supplied to Newsday. In addition to projects already under way, more launched as students and teachers headed into the summer break. These span a broad range, including infrastructure upgrades, designation of a single point of entry at schools, installation of metal detectors, and some measures that districts refused to divulge as a security precaution. In recent months, systems across Nassau and Suffolk counties hosted security forums for parents, residents and students. Barri Levitt, 17, of Woodbury, speaking to the Syosset School Board last month, said she and other students had talked with one another about the possibility of a shooting, trading opinions on which classroom would be the safest to be in. “We should be equally safe throughout the building, and we should have enough security guards so we don't have to wonder, 'Should I eat my lunch in the student lobby, or is there a chance that I will not go home today?'" said Levitt, who graduated from Syosset High School in June and has a brother heading into 10th grade there. At the state level, Comptroller Thomas DiNapoli in June announced plans to conduct security audits of a sampling of local schools both on the Island and elsewhere in New York, as well as the state Education Department and the New York City Department of Education. State Education Commissioner MaryEllen Elia, in a statement to Newsday, said the department seeks to enhance safety in three ways: "by improving the climate in our schools and focusing on students’ social-emotional needs; reviewing the ways in which we use and report data; and providing resources that enable schools to better secure and harden their facilities." 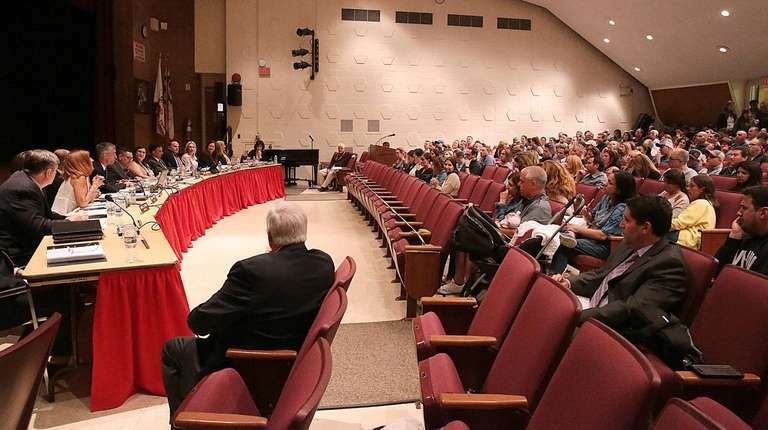 In June, Syosset parents and community members crowded into the auditorium at South Woods Middle School for an update on the district’s two-phase facilities upgrade, which includes measures to secure school buildings and grounds. “We, like lots of other districts, are very attentive to security,” Superintendent Thomas Rogers said. The district in 2015 had an architect's evaluation of its buildings and a security audit by a school safety specialist, he said. With a plan of action approved, construction began this summer and will continue in summer 2019. Projects include adding security vestibules to all buildings, so there is a single, secure point of entry; replacing glass-enclosed corridors; putting up perimeter fences; and placing maps in the lobbies to help first responders with the layout. The school system has increased its security staff and added mental health supports. “The district is doing so much on so many fronts,” said Wendy Levitt, whose daughter, Barri, voiced her and her classmates' worry about safety to the school board. The biggest area of concern right now is “making everybody feel safe, because so many times in life, perception is reality,” said Levitt, who also serves on the district’s newly formed parent advisory committee focused on security and safety issues. "I don’t think that the problem is solved simply by hardening the buildings," she said. In some districts, schools have added detailed security procedures such as a visitor management system. When a person arrives, he or she must show a driver's license or other valid identification to security personnel. A device scans a visitor’s photo, with that visitor wearing a badge while in school buildings.The system allows the greeter and the security guard to rapidly identify and log visitors, volunteers, employees and vendors. A number of districts have added cameras — internally and externally. The Montauk district, for instance, will install security cameras in all internal hallways, school officials said. All exits and some hallways already are covered. However, Dale Yeager, criminal analyst and chief executive officer of Pennsylvania-based SERAPH Inc., which provides security consulting for a number of entities including schools, said that equipment can only go so far in protecting students. The corporation offers security audits for school districts and conducted a recent one for Harborfields. At local forums on security, some parents spoke of their concern about finding a balance in ensuring that schools are secure, safe places for their children while not making the buildings appear as fortresses. Harborfields parent Candace Gundersen, at her district's forum, said she would prefer incorporating environmental design as a security deterrent. “I truly believe if we want to see the world change for the positive, we need to create environments for our children which foster safety and freedom, not reinforce and /or instill fear in them,” she said. 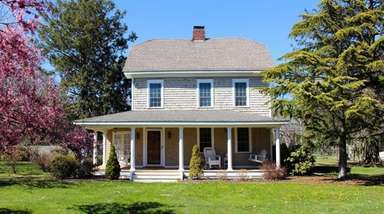 Gena Ancona, 38, of Yaphank, who has a son going into seventh grade in Bellport Middle School in the South Country district, expressed her viewpoint that schools are not doing enough. Although the slayings at Sandy Hook Elementary School were committed by an outsider — Adam Lanza, 20, a former student from years before who fatally shot himself as first responders arrived at the scene — many school shootings were committed by students, Ancona pointed out. She does not believe there is enough talk or education on mental health issues, or enough training for educators to recognize risks, she said, adding that schools should do more with law enforcement and that “threat assessment teams” within a school should be better trained and include specialists. State officials are discussing the possibility of "active shooter" training as a requirement. Currently, New York mandates that districts hold eight fire drills and four lockdown drills during the academic year. 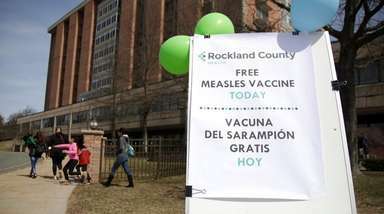 The recommendation would come from the New York State School Safety Improvement Team, comprising staff from the governor’s Office of Public Safety, State Police, the state Education Department, the state Division of Homeland Security and Emergency Services, and the state Division of Criminal Justice Services. The team started discussing the possible change this year, officials said. The state has not yet issued any sort of guidance to districts on active shooter training. 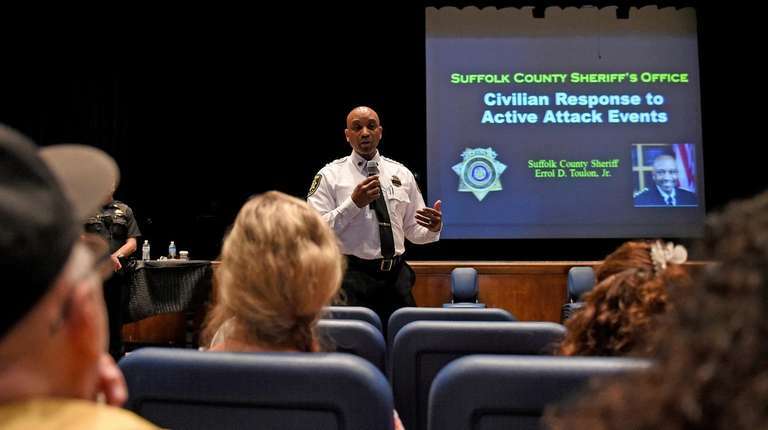 Locally, after the Parkland shooting, the Suffolk County Sheriff’s Office began offering “Civilian Response to Active Shooter” training sessions. More than 1,200 faculty and staff members at a handful of school districts, including Riverhead, have been trained, and three more districts plan to offer the training in August, according to the sheriff’s office. The hourlong presentation describes what happens to a person in an emergency situation and how to respond, based on lessons learned from attacks. The Nassau County Police Department has provided active-shooter training for more than 400 building principals, as well as the superintendents of the 56 public school districts in the county, and many of the private and parochial schools and yeshivas, department Commissioner Patrick J. Ryder said. Tom Calandrillo, 72, a 1964 Harborfields graduate who was at the district's security forum, applauded the Suffolk sheriff’s office for offering the training and said the district should take advantage of it. “This is a very serious thing and a little more training wouldn’t hurt," he said. Ensuring safe evacuation is part of the sweeping security audits that DiNapoli announced to examine whether schools and education agencies have adequate and up-to-date safety plans in the event of a school shooting or other major emergency. As part of the audits, the comptroller's office will look at plans that schools were required to put in place under the state Schools Against Violence in Education Act, which became law in 2000 with the aim at promoting a safer environment in schools. The safety plans included procedures on safe evacuation, communication in emergencies and first responders' access to building plans. The audits “should give us a baseline which to evaluate if there are gaps,” DiNapoli said. School districts currently are required to submit their building-level emergency plans to the state Education Department. They also must submit their plans to State Police and local law enforcement. Suffolk County Executive Steve Bellone this week signed legislation for a $2 million bond to cover the licensing for public and private schools across the county to access a smartphone-based application that alerts authorities in the event of an active shooter or emergency situation. The Rave Panic Button allows communication between first responders and those on the school premises, and provides building-level safety plans digitally to those responding, including the layout of school buildings. Approximately 25 Suffolk County schools have expressed interest in using the application, and some could have it up and running by fall, officials said. Nassau County introduced the application to its public schools in 2016. To date, 44 of the county's 56 public school districts are using the program, and the rest will be up and running before school starts this fall, according to the county police department. At least one district – Massapequa – has joined the small group of schools on Long Island that have added armed security guards to their campuses. 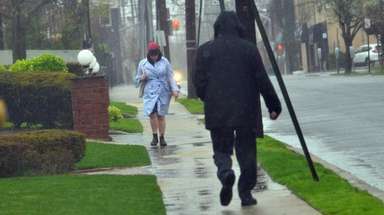 The Nassau County district joins others, such as Hauppauge and Miller Place, that have taken similar steps. The school board voted 3-1 in late June to hire armed guards. The district has not yet hired a company to provide the service, and details as to how the guards will be used and where they will be located are still being determined. However, the district hopes to have a contract finalized and armed guards in place for the start of the school year. This issue has been hotly debated in school systems in other parts of Long Island. At the security forum in the Harborfields district, one parent called for the system to hire armed guards while others booed and protested that suggestion. 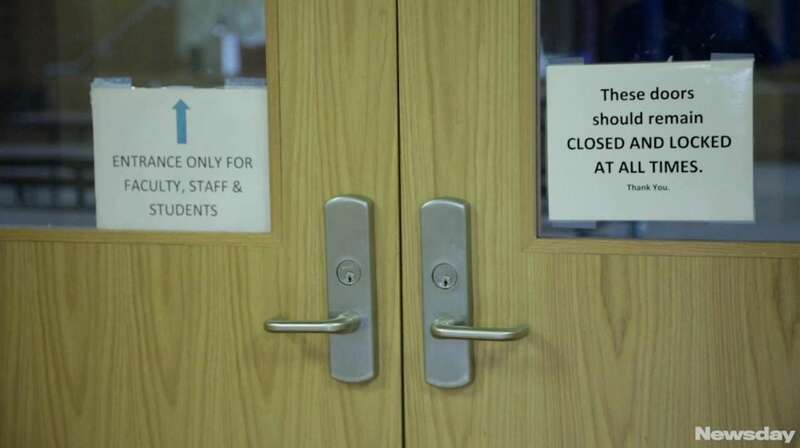 Harborfields, which contracted with an outside firm during the 2017-18 school year to conduct a districtwide security audit, does not have armed guards on staff. Some residents said they want it to stay that way. “We plan on being present at every turn to head off even a whiff of guns in our schools,” parent Jody Fisher said. Sheriff Toulon said that his office has a presence in districts across Suffolk County, but doesn’t have the resources to do daily patrols in schools, nor should it. In the spring, his office began providing security risk assessments to schools, reviewing infrastructure, policies and procedures. Michael Nagler, president of the Nassau County Council of School Superintendents, said the partnership between the police, especially the Nassau County Police Department, and local districts has really grown and strengthened in the last year – even more so in the last six to nine months. “The officers will come in and do a walk-through with building principals,” Nagler said. They look at a checklist and give suggestions and focus on key measures to aid in the policy and procedures should an event occur, he said. Nassau police require all of the department's 177 patrol cars that are on-duty daily to visit a school in the county once a day, Ryder said. "In order for you to police something, you have to understand it. You have to understand the culture. You have to understand the environment." The key is quicker response times, Ryder said. "If we can get there quicker, we understand the environment when [we] get there, [we've] slowed the shooter down, and the people inside the building are trained on how to react to an active shooting — that's how you save lives." Stuart Cameron, chief of department for Suffolk County police, holds student safety and security as one of his highest priorities. He noted that law enforcement has a very strong partnership with the local schools and have added programs and training for educators and police response to potential school incidents over the years. There also have been several upgrades to communication between schools and police, and local police share resources, reports and other data with education officials. “We have a wonderful relationship with the superintendents, and I think we will continue to work with the goal of making students in Suffolk County as safe as possible, so when parents send them off to school they only have to worry about things like grades and after-school activities and not their children being subject to harm,” he said. The Smart Schools Bond Act, approved by voters statewide in 2014, was ballyhooed as a way to help schools upgrade technology. But those funds also can be used for security-related projects such as surveillance cameras and high-tech locks, and many systems are doing so. Overall, the bond act authorized $2 billion to finance the updating and installation of infrastructure and technology. Districts on the Island alone have been approved to spend more than $10.8 million in Smart Schools bond money on security-related projects, according to data from the New York State Association of School Business Officials. Statewide, of $441 million-plus in spending plans approved to date, districts plan to use approximately $63.7 million for security-related projects, the association's data show. In addition, of the school budgets for 2018-19 brought before voters in May, 37 of the Island's 124 districts had security-related projects or were hiring additional security personnel, according to a Newsday analysis of budget proposals and propositions. There is another monetary boost provided under state law. The New York State Secure Ammunition and Firearms Enforcement Act, or NYSAFE Act, signed into law in 2013, included a 10 percent increase in state aid for districts that performed approved work. The incentive was extended by lawmakers this past legislative session for the next five years. However, both the capital project and Smart Schools bond approval processes are “cumbersome, slow, unwieldy and not efficient,” said Michael Borges, executive director of the Association of School Business Officials. Capital projects must be reviewed and approved by the state Education Department, which is charged with issuing building permits for all districts statewide. Those can take nine months to go through the Education Department, and Smart Schools approvals can take even longer, having to go through the department as well as be approved by the Smart Schools Review Board, Borges said. That board — with representatives from the Education Department, State University of New York system and state Division of Budget — meets only when there is a critical mass of projects to consider. Such delays can affect a district's bottom line, as construction costs can rise while the project is under review. "The schools are doing their part," Borges said. "I think the state needs to step up and streamline the process." Commissioner Elia has said the delays have been caused by issues with understaffing and an inability to find qualified engineers and architects at state pay rates. The department has been working to address the backlog, including asking districts to only submit completed plans and having qualified, third-party vendors help review projects, state education officials said. "It is, of course, critically important for school officials to ensure their facilities offer as much protection as possible," Elia said. Renewed emphasis on schoolchildren's safety and well-being has brought the issue of mental health to the forefront. New York is the first state in the nation to require mental health education as a component of health education in state law, with regulations that went into effect July 1 mandating that public and charter schools include mental health in their curriculum. State Education Department officials, in a presentation to the policymaking Board of Regents, gave recommendations for schools, including the provision of "safe spaces" for students to discuss their feelings and the hosting of community wellness events. Some schools on the Island and elsewhere in the state already have offered mental health instruction and resources. The new regulations now require that all schools — at the elementary, middle and high school levels — now must include mental health as part of their existing physical health instruction. “The public is finally coming around to the notion that to properly address mental health issues, we must first acknowledge and openly discuss them,” Education Commissioner MaryEllen Elia said. Last month, the Harborfields district detailed its mental health curriculum, part of a broader effort to make schools more safe that includes new procedures and hardware. The district conducted a survey of students in grades six through 11 and staff on a number of mental health issues, such as their awareness of who to turn to in times of crisis, what services are available and how to access services. In addition, the system outlined the clubs and activities it offers students in the interest of promoting their involvement and their mental health, such as anti-bullying programs. “We will assist in reducing the stigma associated with mental-health-related illnesses, offer support services for those in need and inform students about available resources both in school and in the community,” a district spokeswoman said. The Sayville school board recently authorized the hiring of two pupil personnel professionals, a social worker and a psychologist, to better address educators' increasing concerns about the social, emotional, and mental needs of the students, school officials there said. 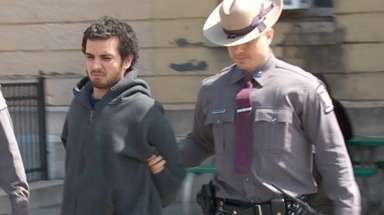 Glenn Liebman, chief executive with the Mental Health Association in New York State Inc., said the group lobbied for the law so instruction of mental health would be required. The group has created an online resource center for educators. “Unrecognized, untreated and late-treated mental illness elevates the risk of mental-health crises such as suicide and self-injury, Liebman said. "Early treatment enhances potential for recovery and also diminishes negative coping behaviors such as substance abuse." Twenty-three Long Island school districts have received state approval to spend money under the Smart Schools Bond Act on security-related improvements. These school systems are among 146 statewide using the bond act money for security purposes. Voters statewide approved the Smart Schools Bond Act in 2014. Districts also can apply to use the money for technology. Source: Analysis by New York State Association of School Business Officials of Smart Schools Bond Act funds approved.